All of the active properties of freshly cut Aloe Vera are suspended within the medium of water. Apply externally, massage into skin. After 12 hours wash off and reapply. Keep refrigerated; use within one month. 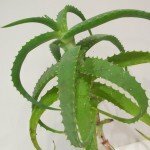 As Elizabeth uses fresh Aloe Vera leaves, this topical gel is made to order only. Please telephone 01273 891 472 to place your order and payment.